Utah’s National Parks are simply stunning. 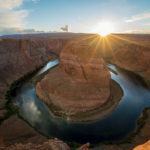 From lush green valleys and sandstone formations in every shade of orange to deep canyons and expansive panoramas stretching as far as the eye can see, Utah’s National Parks will take your breath away, transport you to another planet, and inspire your inner sense of adventure all in one fell swoop. You could spend an endless number of days exploring Utah’s National Parks and still leave hoping for a return visit. But if you’ve got a week, you can experience Utah’s unbelievable beauty on an unforgettable road trip. Save this Utah guide on your Pinterest travel board. If you don’t live near Utah, you’ll need to fly into the region. You could also fly into Las Vegas and do this road trip in reverse. It’s great to have both options because you can search for cheap flights with some flexibility. Even better if you’re using miles and points to book an award flight as there may be available seats in one starting point but not the other. Whichever airport you fly into, you’ll obviously need to rent a car if you’re traveling without a guide. Both Salt Lake City and Las Vegas are major airports with plenty of car rental options. Consider the time of year of your trip. Some of the parks have steep and narrow roads. If you want to do any off-roading, definitely rent a vehicle with 4-wheel drive. That being said, I went in spring and rented a basic 4-door car and had no problems. 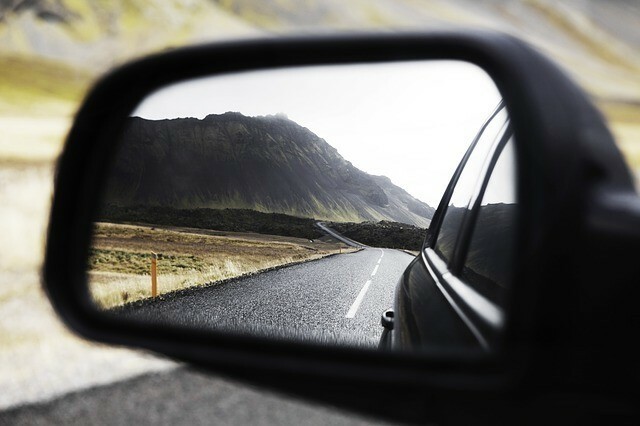 Either way, see how you can save money on your car rental with this secret weapon of mine. If you’re doing a guided tour of the National Parks, flying into Salt Lake City makes the most sense. A guided Mighty 5 tour takes the hassle out of planning a DIY Utah road trip and could make sense if you’d rather not drive. If you’re planning to drive to Utah from where you are, be sure your car and everyone in it are ready and prepared with this road trip packing list. 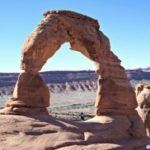 Once you’ve picked up the car, head southeast for the 3.5-hour drive from Salt Lake City to Moab, Utah. Moab will have everything you need from food to gas to lodging. Once you arrive, settle in and get ready for a fresh start in the morning! I recommend the Holiday Inn Express in Moab. It’s on the main road through town, close to 2 National Parks, and comes with a free breakfast. Perfect when you’re planning a day of hiking and outdoor fun! If you’ve landed in Salt Lake City in the morning and have a full day to get to Moab, consider a stop at Antelope Island State Park. You’ll get to see the Great Salt Lake and have a chance to spot wildlife like bison roaming freely. Can you spot me under the massive Delicate Arch?! If you arrived in Moab after dark, prepare yourself! The morning light reveals the orange and red rock formations surrounding the city. Waste no time and arrive at Arches National Park in time for opening. The park is just 5 minutes from downtown Moab. Buy the America the Beautiful Pass to get entrance to any National Park for a whole year or find out ahead of time if you qualify for another way to save money on National Park entrance fees. After visiting just a few parks, the $80 pass will pay for itself. At Arches National Park, you won’t want to miss the views from the park’s scenic drive, hiking up to Delicate Arch, or walking down into Park Avenue. Remember to pack water and lunch/snacks for the day. Moab has plenty of places to stock up. Arches heats up even in the spring and fall. The rocky desert landscape has no cover from the sun and only a couple spots to drink from a water fountain. When the day is done, spend 1 more night in Moab. Try some delicious Mexican food at El Charro Loco Mexican Grill and prepare for another day outdoors tomorrow. The views at Canyonlands are epic! Canyonlands National Park is divided into 4 districts. The Island in the Sky section of the park is by far the most visited area. After checking out of your hotel this morning, make the 20-minute ride from Moab. Again, remember to have the food and water you need for the day before leaving Moab. Just before reaching Canyonlands entrance and visitor’s center, take a detour into Dead Horse Point State Park. 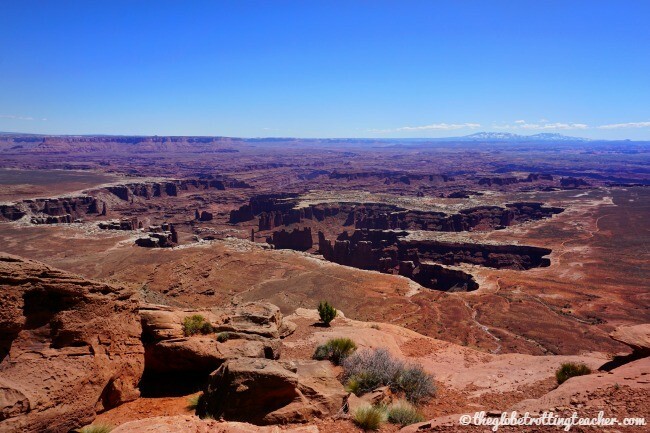 The lookout at Dead Horse Point Overlook is a must-see! After this brief stop, return to the main road and on to the entrance of Canyonlands National Park. Drive the entire scenic road through the park, hopping out to hike or take photos from the numerous scenic overlooks. Be inspired by the vast panorama of the canyon stretching outwards from Mesa Arch. Walk the easy hike along the ridge at the Grand View Point Overlook. By late afternoon, say goodbye to Canyonlands and begin the 2.5-hour drive to Monument Valley. If you have a clear night, look to the sky for some terrific Monument Valley stargazing. 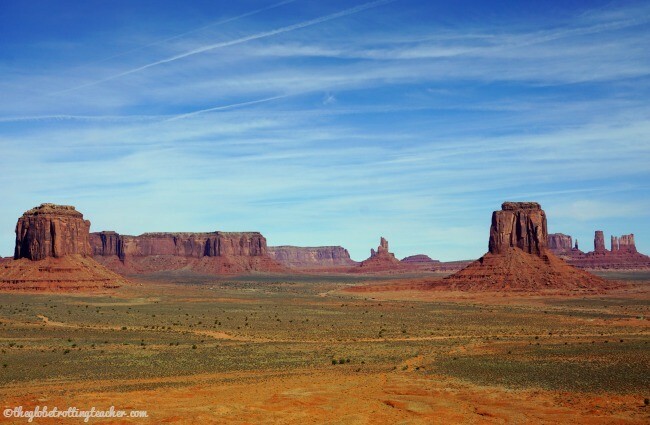 When you arrive in Monument Valley, you’ll have only a couple of hotel options. I highly recommend The View Hotel in the Navajo Nation or the Goulding’s Lodge just 2 minutes away. With just 1 night’s stay, either one will serve you well. Gas up as you drive back through Moab on your way out of town. Gas stations and rest stops are far and few between as you head south on US-191. John Wayne or Forrest Gump could arrive any moment! Tumbleweed blows across the open valley. Iconic sandstone monuments dot the landscape. You’ll feel as if you’ve stepped into a scene from an old Western with a bunch of cowboys chasing down a group of thieves! 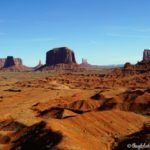 The most popular Mesas, Buttes, and Spires are along a 17-mile loop within the Monument Valley Navajo Tribal Park. You can join a guided tour or drive yourself. I drove my small rental car with no problem. Yes, the road is rough and bumpy, but if you drive slowly and carefully, you’ll be fine. Choosing the self-driving option also allowed more time to enjoy the views and go at my own pace. Bryce is a tiny town right at the edge of the National Park entrance. I highly recommend the Best Western Plus Ruby’s Inn. Book a room for 1-2 nights. You may save money by staying in less expensive Bryce for 2 nights. Bryce National Park and Zion National Park are less the 2 hours from each other. You could easily stay the 2nd night at your less expensive Bryce hotel and wake up early on Day 6 to make the drive to Zion National Park. Bryce Canyon National Park is like descending into a fairytale land where sandstone hoodoos stare up at you from a natural amphitheater and show off their brilliant shades of orange, pink, and red. This National Park is like no other. Drive the scenic road through the park stopping at must-see overlooks like Sunrise and Sunset Points. Hike along the Rim Trail. Go down into the Canyon following the Queens Garden trail or complete the Navajo Loop. 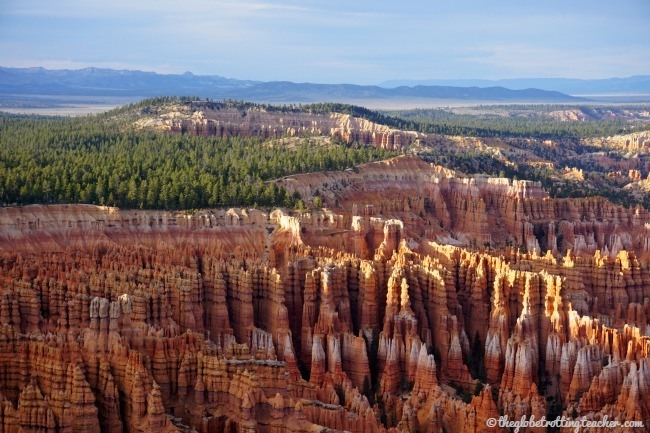 No visit to Bryce Canyon is complete without seeing the sunrise over the hoodoos. The orange and pink hoodoos turn absolutely fiery as the sun first hits them. The small town of Bryce is just outside the National Park. Scramble out of bed to see the sunrise. Then, if you want, head back to town for breakfast before a day of hiking and exploring. In spring, the leaves at Zion are bright green. Zion National Park grabs you by the senses and overwhelms you with its magnificence. 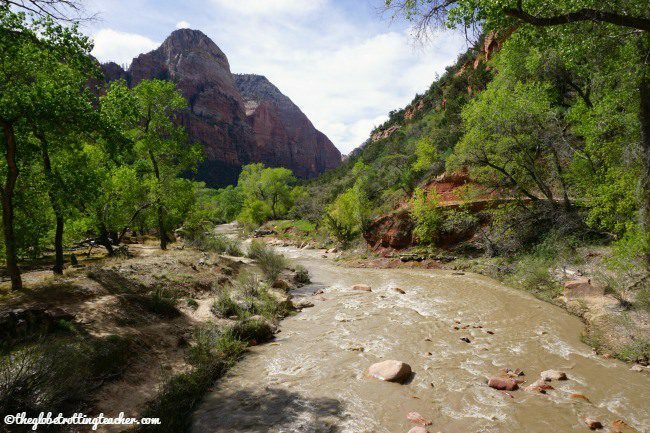 You’ll understand how special Zion truly is from the moment you drive along the Mount Carmel Scenic Highway with its towering mountains on all sides. Zion offers an endless number of activities for every type of adventurer. Hike, horseback ride, mountain climb, and spot wildlife to your heart’s content. Springdale, Utah is the park’s gateway town. You’ll find everything you need from lodging and food to tour and gear shops. Whether you checked into your Springdale hotel last night or this morning, plan to ride the free Springdale Shuttle to the National Park’s entrance. Be sure to have your America the Beautiful Pass! From there, you’ll catch the Zion National Park Shuttle to different points within the park. Unlike the other National Parks, there is no scenic road through the park itself. Shuttles run continuously to pick up and drop off park visitors. I highly recommend the Holiday Inn Express in Springdale. Not only was it the nicest Holiday Inn Express I’ve stayed in, it had a pool and the free town shuttle bus to Zion stopped just outside. Success is reaching Angels Landing! 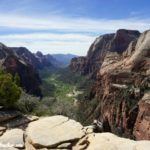 Zion National Park has a couple of famous hikes like Angels Landing and the Narrows. 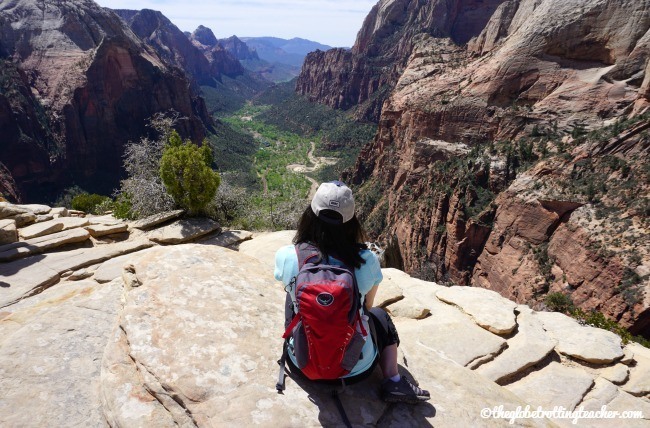 Angels Landing is a strenuous and steep hike to reach the lookout over Zion Canyon. The Narrows treks through the Virgin River and is open only when the water levels and current are safe. Unfortunately, it was closed when I went. If you’re physically fit and not afraid of heights, I highly recommend giving Angels a try! It’s a tough climb and descent and you absolutely have to be careful. But, the view and the accomplishment are worthwhile rewards. Check out of your hotel in Springdale. Tearfully, say goodbye to Zion and make the 2.5-hour drive to Las Vegas. Plan to return your rental car at the airport. Then, head for home with unforgettable memories from your fantastic Utah National Parks road trip! 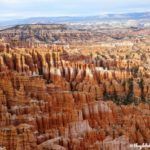 If you’re short on time or would rather base yourself in Las Vegas, guided Bryce and Zion tours make it easy to experience some of what these national beauties offer. Plenty of visitors add a few days to their trip to see Flagstaff and the Grand Canyon. You could fit this in after Monument Valley or Zion National Park. Antelope Canyon is a natural wonder between Monument Valley and Bryce and Zion National Parks. Why not plan extra time in the area to take a guided tour? You’re so close! Why not do an Arizona road trip and head south towards Tempe and Tuscon?! Spend 1-2 days in Las Vegas. After a week of outdoor fun in Utah’s National Parks, a posh Las Vegas hotel, fine food, and some nightlife might be the perfect way to end your vacation. If you’re returning to Salt Lake City and have a little time, have fun doing an urban adventure scavenger hunt or taking a city tour. 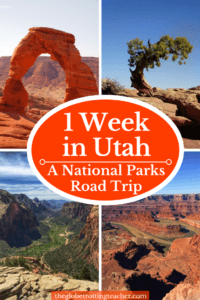 So, what are you planning to see and do on your Utah National Parks road trip itinerary? What tips can you share about this itinerary? I don’t know when Utah will happen in my life. You have triggered my travel pangs to the place. The itinerary is well detailed but at the same time I could not choose one over the other. Luckily, Indrani, you can see and explore these parks with just a week. Plenty of time to visit other places in the USA, too. What a remarkable landscape. Utah National Parks is one of the prime reasons I want to visit USA for. This post makes it look very do-able…thanks for this. Thanks for reading, Punita.The Utah National Parks would have to be up there in the top 5 or 10 USA experiences to have. We briefly ventured in to Utah when we lived in Arizona and did visit Monument Valley, which is gorgeous. 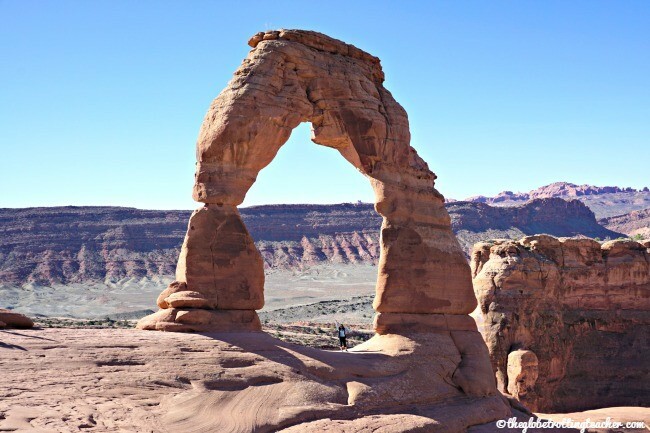 But we’d love to go back and Arches NP, Canyonlands NP and Moab are all on our Utah bucket list. Thanks for this itinerary. We’ll keep it in mind when we get around to finally planning our Utah trip. Sounds like a very busy week. There are so many amazing National Parks in Utah I am always torn between the epic road trip and a deep dive explore of one or two parks. Sounds like you put together a trip that you get to see everything and perhaps, make a choice what to come back to and explore later. It was busy but so much fun, Jen. If I had to pick one to go back to for a deeper dive, I’d go with Zion. It’s so majestic. Truly a one of kind National Park. This is awesome and a must save because I would love to see many if not all of these places. You’d love a Utah road trip, Holly! Gorgeous part of the USA. What a beautiful place! More I see photos such as this and read articles on Utah more I want to go now. I once was browsing thru a book on all the national parks of US. It is just truly amazing. Thanks, Nisha. Yes, the U.S. has so much open space to explore in its National Parks. There are so many gorgeous spots to explore. Hope you make it soon! Such great tips! We love Utah but have quite a few parks to check out still. 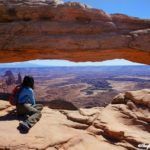 We’ve only made it to Arches and Zion, but I’d love to explore them all sometime, especially Canyonlands! Your photos are great and make me want to plan another road trip out there again soon! Thanks, Jenna. 🙂 Canyonlands, I think, is a hidden gem. You hear so much about the other parks, but then Canyonlands just quietly captivates and overwhelms you. Hope you can make out west again soon. I love Utah’s National Parks! 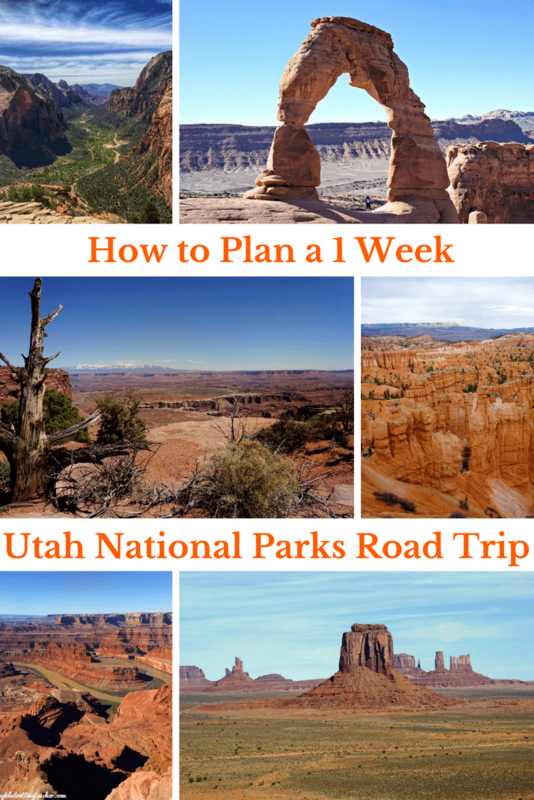 Fabulous itinerary, thanks for putting each of these parks into an itinerary we can do in a week 🙂 We were in Utah two years ago now though didn’t have nearlly enough time to properly explore the state. We hit up a couple of State Parks which were in our area, and then did Arches, but Bryce, Zion and Monument Valley are still on the list. Going for at least a full week next time! Aren’t they so great, Meg?! Everyone really needs to spend some time out there and even with a week can have a great experience. Hope you make it back in the near future! Totally just what I need! This roadtrip is on my bucketlist. I really hope I can do it this 2017. Saving this and thanks for sharing. Can you also share with me the car rental cost? I am not sure I can use my friends car for the whole week so I might rent. You’ll love this road trip, Carla. It’s really fantastic. So my car rental cost was a bit different because we rented one in NYC and drove across country first. But, I recommend making a car rental reservation with any site (Kayak, Car Rentals, etc), then tracking your reservation with Autoslash. Autoslash is my secret weapon for saving money on car rentals. They’ll search for a better price continuously and let you know when they find one. As long as it’s not a last minute reservation, I all but guarantee they’ll find you a better price. I’ve done better every single time, as have my readers, family, and friends. Good luck! This kind of trip has been on my bucket list forever now. You’ve given me so many great ideas! I’ve always wanted to go to Bryce, but there’s so much more! Utah is a treasure trove, Lauren. Bryce is just the beginning! Hope you can take a road trip soon! Thanks for the great write up. I’ll have a couple days to spare. Did you feel that any of these parks were rushed at all? Would you stay at any other than Zion for an extra day? I’m so much into going but how can I find travel mates? I am not looking for dating just people whom I can trust to travel with. where can I find them and plan the trip together? THanks so much for reading. I’d look for Facebook groups with like-minded travelers looking for travel buddies and go from there. 🙂 Don’t underestimate solo travel, though. It’s such an opportunity for personal growth. This is exactly what I needed! I am taking my mom and one of her friends (in their 70s) and my 12 yr old son on this trip in May. Your itinerary and tips are really going to help. Do you have any suggestions for hikes for seniors? They are both in good shape, but they don’t need to do anything too rocky. I do have another question- I saw that you would have stayed longer in Zion if you could….you would pick an extra day in Zion over Arches? Just checking before I decide..
I’m so glad you’re finding the guides helpful. 🙂 I would absolutely spend the extra day in Zion over Arches. There’s so much about Zion to take in. The more time there the better. Am thrilled to find your blog! 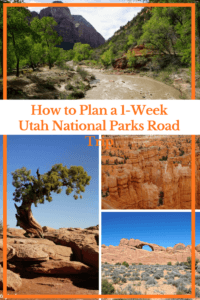 Your week-long tips for traveling through the Utah canyons has been so helpful. We just booked and will explore these canyons this coming June! I am a teacher as well and won’t retire for 6 more years. My husband and I LOVE to travel, but are starting to worry about spending money on traveling rather than saving for retirement. 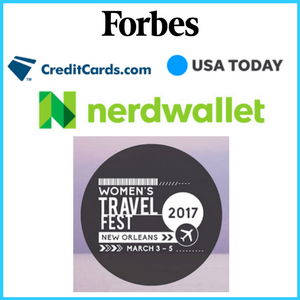 We have never used miles and points b/c we don’t travel that often, but I’m wondering if we should start. I know nothing about it. Thanks so much for reading! I love to have fellow teachers following along. 🙂 I’m glad the Utah tips are helpful. The National Parks out in Utah are just incredible. My whole approach to miles and points is making the money you’re already spending on bills and everyday life work harder by giving a return in the form of travel rewards. If you’re interested in learning a bit more, check out my free basics course at theglobetrottingteacher.teachable.com/p/travel-hacking-basics There’s no obligation of anything and it’ll give you the basics. Whether you take 1 trip a year or many, miles and points can help you save money on travel costs. Enjoy Utah!! I’m trying to plan a trip for my family to Utah in March and this itinerary is perfect and saves me a lot of time! It got me so excited. Thank you!! With one day at each park would you say it’s sort of rushed or is that definitely enough time to see what you’d like at each place? Thanks so much for reading and glad the itinerary is helpful for you! It depends on how much you want to go off-the-beaten-path or not? I was definitely glad to stay in Zion for a couple days. Arches and Canyonlands were fine for the day. For Bryce Canyon, I did a day and a half. I was glad to do the drive through the park on the afternoon of my arrival for the sightseeing. The next day was for hiking and was fine for my April visit. (Keep in mind for a March visit (like mine in April), Bryce may still have snow in spots closing off some of the hiking trails.) Hope that helps and you have an amazing trip! We are planning a trip this summer ( I too am a teacher) and I was wondering about the rental car. We have been told that it is more expensive to return it to another airport. We could fly into Vegas or SLC but we thought we had to do a loop because of the rental car. Did you run into this? Thanks so much for reading. I love chatting with fellow teachers about their travel plans. 🙂 To be honest, we drove back and forth across the country as part of our adventure. However, I have rented a car and returned it to another location. It depends on the location and time of year so fees vary. I use a website called Autoslash to track my car rental reservations. Make a reservation with any website. Then enter the details at Autoslash. They’ll let you know if they find a cheaper price. I’ve always saved money with them. Hope that helps! Have a great trip! We weren’t able to fit Moab and canyonlands into our Great Southwest Adventure instead opting for a round trip out of Vegas and doing the north and south rims of the Grand Canyon. My biggest tips would be to stay IN the parks if you can to be right in the middle of the action (but you can’t use points) and if you’re going to hike The Narrows rent the water boots and poles from the adventure shop in Springdale. Water sandals weren’t sufficient. Makes me want to go back! Thanks for reading and for the tips, Angie! Sounds like you had a great trip. 🙂 Hope you can make it back to visit Moab someday. Great write up, thanks for sharing. We are planning a trip this fall maybe October, coming from Vermont, and are looking forward to hit the road again. We did the Big Sur, and route 66 a couple of years ago, great time. One question, did you have to make any lodging reservations on your trip? And if not, did you have any problems finding lodging close to where you were exploring and hiking? Wow. What a great resource for planning this trip. What is a better time? Late April or Late September. Thanks for the article. Great itinerary and sounds great even with teenage kids, which is my plan. Would this trip work for roundtrip from Salt Lake City? How far is Zion, last stop, back to SLC? I am flying in and the car isn’t my concern but roundtrip tickets from same airport tend to be cheaper. Hi! Thanks for the info! I enjoyed this post. I live in Las Vegas and we are getting ready for a 6 day Utah trip: Zion, Coral Pink Sand Dunes, Monument Valley, Natural Bridges, Capitol Reef, and Bryce. We decided to skip Arches/Canyonlands on this trip so we wouldn’t be rushed. Wonderful, wonderful post. Thank you so much. So glad you included Monument Valley. We are a family of 5 (kids 16/14/12) and I am putting together my itinerary for 9 actual days + 2 flying days, flying in and out of Salt Lake City. Where would you spent the extra two days? We would like to go down to the North Rim of the Grand Canyon which looks like it is a 2.5 hour journey from either Bryce hotels or Zion Hotels. So North Rim would likely be an extra day and then if we add an extra day to Zion, and finally a day in Salt Lake City at the end to recover and see Antelope Island, then we have the three additional days. Thoughts? 1) Since we arrive late into SLC, we will stay night 1 there and drive to Moab early the next morning which would be Day 2. 2) Seems that it makes sense to either drive down to the North Rim after leaving Page AZ. Or from lodging in Springdale AZ. I think from Zion makes sense. 3) One of our friend families went on a family ‘canyoneering’ adventure at Zion for a day. Is such a thing worth it for a half or whole day? 4) How long should we plan for at the North rim? 5) I hear that Route 12 from Torrey to Bryce is one of the most scenic drives. How would you incorporate this into one of the days? Tips you may want to add. Friends tell me there is a ‘ghost town’ /cemetary on the way out of Zion called Grafton Cemetary. Driving back to SLC, Mona Utah has a Lavender Farm that could be a nice stop. Thank you so much for any detailed comments. I realize I have asked several questions. Further as I look at things, it may make sense to stay overnight in Page AZ when coming from Monument Valley, check out the Antelope Valley area there, then the next morning go to the North Rim of the Grand Canyon. After that go to Zion and spend two days. Then last go to Bryce, why because then when done at Bryce, we could drive Route 12 through Escalante toward Torrey and then back to SLC so there would be no backtracking. Thoughts? Thank you Jackie. Can I ask another question on logistics and your leanings having been there? Day 10 Drive 3 hours to Antelope Island for 4-6 hours. We would have time to stop at the Lavendar farm. The question remains, is Antelope Island worth half a day? Or should we stay a third day at Zion or two full days at Bryce? I wish you a fantastic day!!!! Jackie one more. Wow, I have read some more in other forums and your advice to spend more time at Zion is right on. I think I will adjust to stay at Zion 3 days, and one day at Bryce. If we one day at Bryce, then do we clip the day at Bryce by driving the Torrey route at the end of that day, or dedicate the entire day, and make the next day long doing Torrey route back to SLC and optionally see Antelope Island…..Or Bryce for 2/3 of the day and then Torrey route and night in Richfield UT (free hotel night there). So many questions but you have a great itinerary that you have shared. 3 days in Zion will be amazing. You’ll have a day for canyoneering. But, then 2 other days to hike, explore, do the park’s scenic drive, etc. (Angel’s Landing is a challenge but worth it! The Narrows is on my list when I return. It was closed when I was there.) I wouldn’t clip Bryce. The park’s scenic drive and stop-offs are already a few hours. Not to mention doing a hike down into the hoodoos! If anything, because Zion and Bryce are relatively close. You could do 3 full days in Zion but sleep that 3rd night in Bryce. The sunrise over the hoodoos the following morning is gorgeous. Thank you again Jackie. Great comments. I have all my hotels booked but having trouble with availability now in Bryce on June 12 for one night. We may need to stay in Tropic or out at Panguich but some reviews of hotels are scary. The ones you recommended are full at this point. Wish I could help there, Mike, but I don’t know anything about hotels in those towns. But Good luck! I’m sure something will work out. Have a good one! Roughly how much did this trip coast you? Hi Michelle, thanks for reading. Unfortunately, I don’t have that number. We didn’t fly. We drove and need a car rental. We booked hotels as we went and made use of some cash back rewards on a credit card to erase some of the charges. The America the Beautiful Pass got us into all the National Parks and it cost $80. Hotels and food were really the biggest expense. Sorry I couldn’t be more accurate in my estimating. This is an amazing post – Kudos! I am planning to do a solo trip to Utah over the July 4th week, but I am going to take your advice of flying into Vegas and doing the whole thing in a reverse order. Any tips/recommendations for a solo traveler? Thanks so much for reading, Dev. I would check each Park’s website for any alerts and pay careful attention to wildlife warnings and/or areas where it’s recommended you go as a few people together versus solo. And, definitely be prepared with plenty of water, food, a charged cell phone, and a basic first aid kit. While I haven’t hiked solo in Utah, I have in Patagonia and the Canadian Rockies. It can be awesome but I always take these precautions, plus let people know my plans. Have so much fun!! Jackie – I just had the most amazing week in Utah, all thanks to your post. Bryce and Zion were truly astonishing, almost other worldly!! Thank you so much for this blog, you did an awesome job! Take care! Hey, Jackie, wanted to say I just started my search for info on southern Utah and this is fantastic. I’m going to read your post again and then all the comments for additional guidance. I’d really like to see the Grand Staircase and I’m thinking maybe doing that instead of Monument Valley. (I couldn’t figure out from Google Maps how to get in there). Do you know anything about weather in late October/early November there? I’m in between going in September, which may be more crowded, or going later in the fall. One more question: I’d like to do the Angel’s Landing hike at Zion but my husband is not that much of a hiker (he’s doing some of the smaller hikes). 1) is it safe for a woman to hike it alone, and 2) are there enough things to do in town so he won’t be bored? Thanks for reading, Jan. So glad the guide is helpful. Grand Staircase is just about a half hour from Bryce and a little longer from Zion. You could easily get there from either of those parks. I don’t have any direct knowledge of the weather in October/November other than the average highs and lows for that time shown on weather websites. Personally, I think hiking when the temps are in the 60s, even 50s, is ideal. As for Angel’s Landing, I hiked it solo and felt totally comfortable. I was there in April so not peak summer season and there were plenty of people around. Springdale is a cute town with some shops and places to eat. The main street is certainly walkable but also accessible by a free town shuttle. Even our Holiday Inn Express had a pool which was great for my hubby who was a little under the weather to relax by while I went off hiking. Hope you have a great trip!! I appreciate your additional info in your reply to my note. We are going last week in September! I’m checking out your site for other vacation ideas. Hi Jackie, this is just what I was looking for. My mother-n-law highly recommended this trip. Do you think I should plan this trip in mid July or is it to hot that time of year? Do you approach a trip like this differently that time of year? This is the only time we have open. Thanks for reading, Mike. It most certainly will be hot. I’d say hotter in Arches and Canyonlands because there aren’t as many places to find shade. It’s wide open, rocky, desert-like terrain. Zion and Bryce will be hot but there are ways to escape constant direct sun either from the trees or the hoodoos when down among them. I don’t necessarily plan differently, but I am more cognizant of starting my days early and, if need be, taking a break for the hottest midday hours before fitting more in as the sun lowers in the sky. I hope you have a great trip!! We are flying into Las Vegas and would love to do Zion NP, Bryce Canyon, and Arches. We have also heard from others that the Grand Canyon is just a 2-3 hour drive from Zion and we should include this… Neither of us have been there and it, too, is on our bucket list. Advice?!?! What MUST we do? We are open to other locations as well…but knew these were great spots that all seemed able to be driven within our time frame. Any chance you can post a map that shows the trip on it, just to show an overview of where each night is spent? Also we are wondering if there is time to stop at the Antelope canyons near Page, and if it’s worth it. This is such a helpful resource–thank you so much! I’ll definitely be returning for more travel tips. Any trouble renting a car in Utah and returning in Nevada? I’ve been socked for extra fees before. Thanks so much for reading, John. Monument Valley is a bit out of the way and I’d focus on what you already have in your itinerary. I’d want to wake up in the places I’d end up for the day, especially with Bryce and Zion. So that would mean seeing Antelope Canyon/Lake Powell and driving to Bryce at night so you have the full day in Bryce. You can easily drive after a day at Bryce to Zion and check in to your hotel that night so you have the whole day at Zion. Depending on what time your flight arrives into PHX, I might build in a little more time to start. Flagstaff is just 2 hours from Phoenix and 90 minutes from the Grand Canyon South Rim. 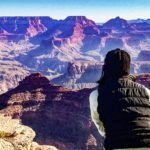 There’s some really cool stuff to do in Flagstaff, but it also could be a way to get settled and ready for the next day at the Grand Canyon without feeling rushed. Have a great trip! You have so many great things awaiting on this itinerary! Enjoy! This is a great iteniary! My husband and I took a week road trip 3 years ago that ended up lasting over 3 months and spent a good deal of time visiting all of these besides Zion (who wouldn’t allow our dog, lol)! We were in love the minute we camped in Moab and continued North. We did this in a frugal budget and more amazing scenery and landscape than I could have ever imagined. Camping, a new passion and stargazing! Take the next left while finding some off the map beauty that we loved! Ashley National Forest is a must, Sheep’s Head Pass is incredible! Fishlake National Park has the most scenic foliage of the alpine trees in fall I have seen! We moved to Utah and there are too many to list! Well done and thanks for sharing with others! Thanks so much for reading, Chris. Appreciate all your expert tips! Utah is just gorgeous with so much to see and do. The stargazing is amazing! Utah’s National Parks seems to be the eighth wonder! Yes; I could spot you under the massive arch. thank you for writing such a detailed article on the park. Thanks for reading, George. I had a good laugh that you spotted me under that massive arch! 😉 The Utah NPs are a wonder, for sure. Hope you enjoy your visit. Jackie: Love your trip. How would this trip be in March ? Would weather be a problem ? We’re older, yet active. We walk ALOT! Hiking? Is there time for that? That being said, no climbing .Weather wise , end of May beginning of June? My husband would do all the driving, i’d Want him to enjoy the drive. Thanks for reading, J. There’s absolutely time for hiking. We hiked Delicate Arch and a few other trails on our visit to Arches. We hiked along the canyon rim in Canyonlands. 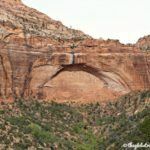 At Bryce, we did a partial rim trail and Navajo Loop trail hike, while at Zion we hiked Angel’s Landing and a few of the shorter hikes off the main stops of the park shuttle. A May trip should be warm and sunny. Hope you enjoy this gorgeous part of the U.S!